Ever felt overwhelmed by long links with too many weird looking parameters? Or maybe you couldn’t recall this 30-character URL you wanted to share so badly? We know these pains all too well. Also, we know the solution – URL shorteners. Yet, we do not always use them. To change that, we’ve prepared 8 reasons to start using URL shorteners each time, starting from now. Let’s be honest, which of these links is more pleasant for your eye? We’ll all agree that the second one is prettier and more trustworthy. People prefer clicking on visually appealing links, especially when the links are customized. That’s where true power of URL shorteners appear. #2 Whoa, free URL customization ahead! Short url doesn’t have to look spammy, with random combinations of numbers and letters. Shorten link to make more compelling and trustworthy with link customization features. Most of the top URL shorteners give you an option to do it for free, although some might ask to sign in or pay for it. Promoting content and your website takes loads of time, so you need to focus only those bringing highest traffic. How? Many url shortners let you track clicks and thus compare the effectiveness of each link. Use it to save time and promote links only in channels that show results. Note: To track number of clicks per each link, you need to log in with your Facebook account. #4 Go beyond number of clicks and see your traffic behavior. Tracking clicks is one thing, but measuring the quality of traffic coming to your website is equally important. Yet, 90% of Online Marketers are not aware of it. To see how any given traffic behaves on your website, you need UTM parameters. In most cases, you’d need Google URL Builder and a random URL shortener to do so. With The Mighty URL shortener you can do both things at the same time. When you shorten link, click “Customize” under the input field, enter any UTM tags and get your shortened, tagged link. Easy-peasy, right? The traffic from tagged links will be visible in Google Analytics Acquisition tab. Check the source/medium tab to get all of the information. Decent URL Shorteners let you manage your links from one place. Quick peek and you can see the list of previously shortened links, number of clicks they generated and original, long versions of your url. Many link shortners offer this feature only in paid accounts. In our case – all you need to do is log in with your Facebook account to get the full feature pack. The more character you use in a message, the more you have to pay. People who use SMS marketing will know that pain. URL shortners solve this without giving up on analytics or other information put in the URL. Pro tip: When you shorten link, people consider it more trustworthy, which improves the click through rate. You don’t have to worry about how your shortened links will look in social media. Majority of URL shorteners pass all of the images and descriptions from the original page. As long as your original page displays beautifully in social media, so will the shortened links. It’s crucial to keep the SEO power within your domain and not pass it to the shortening domain. That’s why you should always check if the shortened link has a 301-type redirect. The good thing is that majority of link shortners use it, so your SEO power is safe. If you are not sure what redirect your link shortener uses – you can check it with this Redirect Checker. We’re making new tools on a regular basis. Subscribe to get notified as new tools are released. 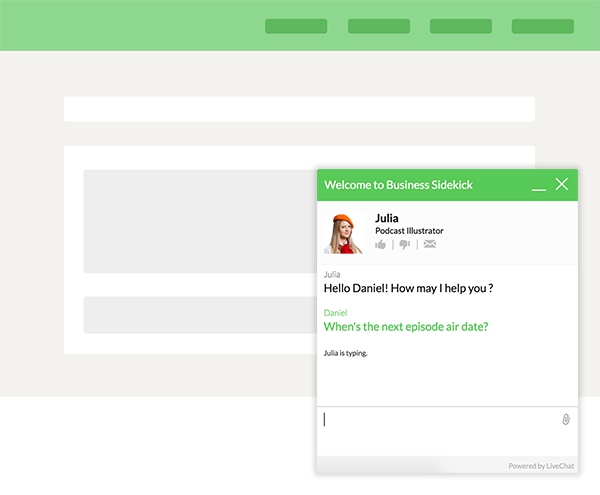 LiveChat is the fastest way to connect with your website visitors. Talk them in real-time, track their behaviour and improve conversion. Give us a try.